Imminkhuizen Metaaltechniek is a true family metalworking business. Rijk Imminkhuizen founded the business together with his wife in 2008. The business concept was to produce complex and simple metal products with maximum efficiency. What started as a modest workshop rapidly expanded into a business whose current range of machines includes four lathes and various processing units. Imminkhuizen Metaaltechniek specialises in the production of parts for machine manufacturers. The company supplies a full range of products for the manufacture of small-scale to extremely large machines in various sectors, including food, shipping and transport. These sectors demand a high degree of efficiency and flexibility from their suppliers. Automation of their Mazak machine was therefore the next logical step for Imminkhuizen. For one thing, it would facilitate faster production speeds and larger production runs without the need to purchase an extra machine. Secondly, it would allow the professional workforce to shift its focus from simple, repetitive work activities to other operations. Imminkhuizen started by looking for an automation system that would allow for the production of relatively simple product series in large batch numbers. “This type of system enables us to compete effectively with low-wage countries. I think this is truly important for production in the Netherlands”, he explains. It enables Dutch machining companies to offer high-quality production at globally competitive prices. Imminkhuizen ultimately opted for the compact and multifunctional Xcelerate. 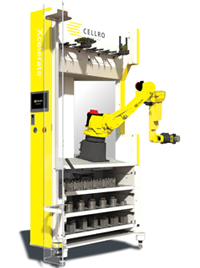 This robot takes care of handling activities for processing discs of up to 150 mm. It also can be used for the (two-sided) processing of bars up to lengths of 700 mm. Due to its modular design, the same system can easily be modified for other applications and products. The Xcelerate system is kept rather busy at Imminkhuizen. “The robot operates for about 12 hours per day.” The production of simple products that do not require any complex measurements can continue at night without any interruptions. That results in a significant increase in productivity for a company where, until recently, production activities stopped after the last employee left the facility.